I like your blog. Thanks for the nice comment on mine. I especially like all the pictures. How did you find mine? Your children (?) are too cute! 2 girls? ONE GOOD THING ABOUT HON'S...IS YOU WILL NEVER EAT A CAT IN THERE. 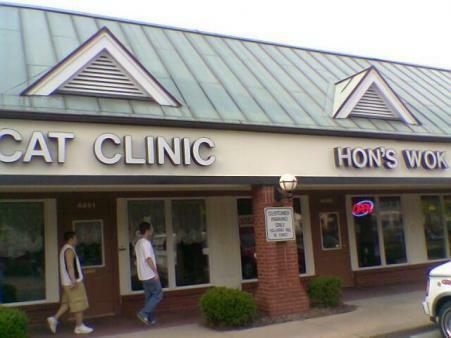 ONE GOOD THING ABOUT THE CAT CLINIC...THE CAT'S WILL TAKE CARE OF ALL THE ROACHES. I am pretty sure we have all had cats to eat. I mean, there isn't all this talk about Chinese food and cats for nothing, is there? To be honest, I am fine with eating cats, dogs, raccoons, squirrles, etc as long as they taste yummy. EVERCURIOUS IS CUTE. DO YOU THINK SHE COULD EVER LIKE STOCKCAR RACING ?? ?